Torrential rains that triggered flash floods that have killed or injured dozens in India, Pakistan and Afghanistan, officials and local media said Wednesday. In central and western India, a powerful storm bringing dust, lightning and unseasonal rain has killed at least 47 people, officials said Wednesday. Indian Prime Minister Narendra Modi expressed his anguish over the loss of lives due to unseasonal rains. "Authorities are monitoring the situation very closely. All possible assistance is being given to those affected," he tweeted. In neighboring Pakistan, rains followed by flash floods have killed 39 and injured dozens in the last two days, officials and local media reported on Wednesday. According to the National Disaster Management Authority, a state-run agency that coordinates between different relief and rescue organizations, most of the deaths have been reported from northwestern Khyber Pakhtunkhwa (KP) and southwestern Balochistan provinces, which have been in the grip of massive rains caused by a westerly system entered from neighboring Iran. In addition to the human loss, some 80 houses have been completely or partially damaged in the two provinces, the authority said. Heavy rains caused flash floods in parts of KP and Balochistan forcing hundreds of residents to move to safer places, while several cities of northeastern Punjab province also received heavy downpour, local broadcaster Geo News reported. Footage aired on television showed several vehicles trapped in waist-deep water as rescue workers backed by army troops help them in parts of Balochistan. The unseasonal rains flanked by gusty winds also downed trees, electricity poles and signboards in several cities apart from causing damage to standing crop of wheat, mainly in Punjab. Most of the deaths were due to roof collapse and electrocution. The Meteorological Offices of India and Pakistan have forecast more rains in the next 24 to 48 hours as the region is under the grip of a westerly cycle of thunderstorms and gusty winds. 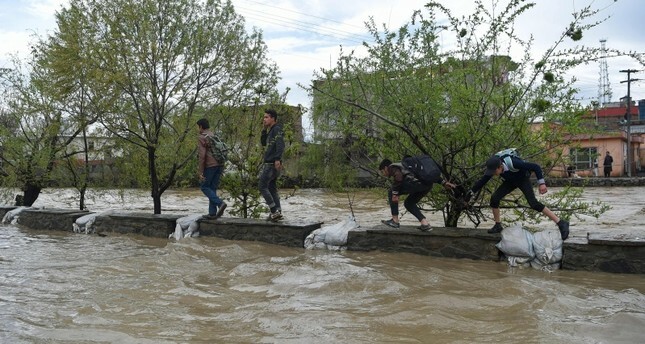 In drought-stricken Afghanistan, torrential rains and flooding have affected 16 of Afghanistan's 34 provinces in the past 24 hours, Afghanistan's National Disaster Management Authority (ANDMA) said. Dozens of homes have been destroyed and livestock washed away, including in the capital Kabul. At least five people died in the western province of Herat when floods caused their house to collapse, said Jilani Farhad, the spokesman for the provincial governor. Herat's disaster and humanitarian affairs director Hamid Mubarez said 17 others are missing in the province.